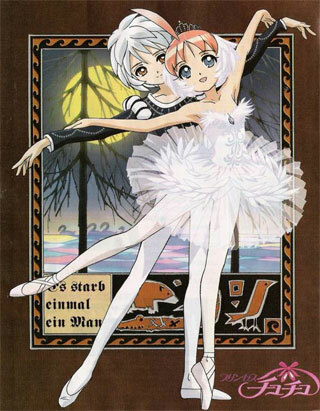 Princess Tutu is a Fantasy/Comedy anime based on the manga by Mizuo Shinonome and published by Akita Shoten. ADV Manga is the English publisher. The 26 episode anime comes from Hal Film Maker and is currently licensed by ADV Films. Japan originally ran the series from August 2002 to May 2003. 13-year-old ballet student, Duck, is clumsy, but good-hearted and sweet... and has a big secret. The mysterious Drosselmayer morphed a young duck into a girl to give her a mission: help a Prince to get the parts of his heart back. With that in mind, she transforms into the beautiful Princess Tutu, whose magical dances ease pain and purifies the bad feelings. However, the evil Raven and his minions soon seek to foil Duck’s plans. The Prince’s friend, Fakir, who refuses to allow the heart shards to return, for reasons unknown, also opposes the Princess. The art and animation of Tutu is simple, yet fantastic when it really wants to be. The entire show is presented as if it’s one big ballet using animation, lighting, and music to its fullest extent. One thing to keep in mind about this series is it’s a magical girl anime. Meaning, yes, there will be a long transformation sequence in about every episode. However, unlike a lot of other magical girl shows, Duck’s transformation into Princess Tutu is only about fifteen seconds; when most others take a full minute or more. Another important thing to point out is the show’s music. A lot of popular musical compositions from ballets are played throughout the story. From the Nutcracker to Swan Lake, these pieces work really well and add just a special touch to the entire picture. Princess Tutu’s story is simple. A duck wants to become a girl so she can try and make the prince smile. A mysterious man gives her the opportunity to do so, and she becomes so much more. The story is also so simple; yet so emotionally investing that it becomes, like Duck, so much more. In the beginning of each episode, there is even a slight narration of a story that will have something to do with the current episode. For example, the passage in the beginning of this review is the narration from the first episode. Other narrations the series gives way to are A Mid Summer Night’s Dream, Sleeping Beauty, and Cinderella. The story really does reach out and pull your heartstrings, and, for probably a good amount of people, will leave you in tears by the series end. wipes eyes what? Oh the characters, what to say about them. In a word: growth. These characters grow so much, coming into their own and accepting who they were really suppose to be, and defying Drosselmeyer’s plans of how the story is to go. Two characters that had the most amount of growth were certainly Rue, Duck’s rival, and Fakir. Both start out very similar to each other because of their wish to protect Mytho, and later on they each become more important and even more relevant to the story almost as much as Duck or Mytho. Each of the four main characters can be relatable in some way and the viewers will even be able to see themselves in, at least, one character. For me, it would have to be Rue. I won’t go into too much detail why, but Rue’s desire for love really hits home for me and even makes me cry a little bit. Tutu’s English dub is outstanding! For a magical girl anime, the cast was taken into careful consideration when the dub was made. Luci Christian (Soul Eater) as Duck was perfect! I seriously had to look online to find out it really was her, and it is certainly one of her best roles to date. Jay Hickman’s (Elfen Lied) Mytho was a little hard to get used to, however, like Mytho, Hickman starts out as unemotional and empty and starts to learn how to feel again once the shards of his heart begin to return. Then you have Chris Patton (Welcome to the NHK) as Fakir. Absolutely splendid! Not only does Patton play our supposed villain really well, but also his panic and pain as to his true purpose in the story become apparent later on. Jessica Boone (Canaan) as Rue was also a lovely choice. Equal parts snobby, cunning, and sweet, Boone displays this very well. One of the more fun roles of this series has got to be Marty Fleck (Project Blue Earth SOS) as Drosselmeyer. Outstanding from start to finish! Other actors include: Christine Auten (SDF Macross) as Edel/Uzura, Cynthia Martinez (Kino’s Journey) as Pike, Sasha Paysinger (Best Student Council) as Lille (really funny girl FYI), and TJP (Mythical Detective Loki Ragnarok) as Mr. Cat (Be careful or you might be stuck marrying him). Plus there are two Narrators for the story: Jennie Welch (Mezzo) and Marcy Bannor (Red Garden). Alright, I’ve stated many times already that Princess Tutu is a magical girl anime. However, there is a different side to this series; a much darker side. For about half of the series, you get the same thing each episode: Duck being clumsy, a heart shard is found, Duck becomes Tutu, and returns the shard to Mytho; Lather, Rinse, Repeat. I don’t want to give anything away, but if you know of the story of Swan Lake, then you already can guess what kind of happens next; and then some. From this point on, the story become really really dark. And some people might begin to ask if this really is a kid’s show. It is, but that’s the appeal of Princess Tutu. It not only tailors to kids, but to some adults as well, including men. I’ve heard from several of my friends, and other critics that “real men watch Princess Tutu”, and I think that’s a real fact. I know of a few guys who have either seen it and loved it or have yet to see it and it is on their list of anime to watch. I’m even willing to bet that a few anime haters will fall in love with the story as well. When the curtain falls, Princess Tutu is a heartfelt story that captivates both children and adults alike. It’s visuals give off the sense of a real ballet and its characters are both entertaining and relatable. This is one of the very few anime I can highly recommend to both guys and girls, and is certainly a top favorite of mine.